Sunday morning, we took the 8:45 hotel shuttle to town even though our hiking excursion wasn't scheduled to begin until 10:15. 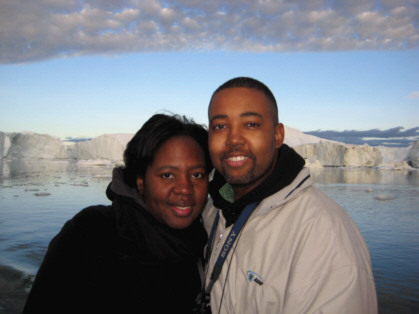 Although we don't speak Greenlandic, we were headed to the 9 AM church service. Let me explain. During our city walk tour the previous day, our guides took us by Zion Church. The construction of this Lutheran church was completed in 1779. We were told tourists are no longer taken inside during the tour because people had stolen hymnals in the past. How someone can have the conscience to steal from church is beyond me. One of our guides told us about how beautiful the singing is during the services. However, when she said that some of the songs are sang in Greenlandic and Danish at the same time, the curious musician in me would not let me miss this experience. It was a little after 9 AM by the time we walked to the church from the shuttle drop-off. The church was packed; therefore, Traci and I decided to sit in the vestibule rather than trying to find a seat in the sanctuary. Additionally, being dressed for hiking, we would have felt really out of place. The church interior looked a lot like the Our Savior's Church we saw during our city tour in Nuuk. I loved all the lighted candles at the altar and at the end of each pew. 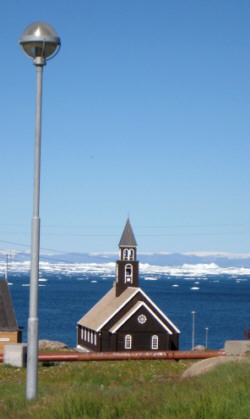 However, what was unique about being at this service in Ilulissat was that many in the congregation were dressed in the national Greenlandic costumes. The men wore loose white hooded shirts with a black bowtie, black pants and white animal hide boots. The women's costumes were much more interesting. They wore pullover blouses adorned with colorful beads. They wore fur pants and tall animal hide boots. I wanted to take pictures as families entered the church but I thought that would have been tacky to do so at the time. Besides, there was a sign indicating no photography during service. This didn't seem to stop a handful of tourists hanging out in the back of the church from snapping away. The only word I understood during the service was Amen. The congregation sang beautiful angelic hymns to the accompaniment of a small pipe organ. As for two languages being sung simultaneously, I couldn't tell. It all sounded foreign to me. We hung out in the church vestibule for about 45 minutes and then headed to the meeting point for our hike. Our first excursion that day was the 2-hour Hike to Sermermuit. There were about 10 of us doing this excursion. Other than Traci and me, two guys from London were the only other English-speakers on this tour. The rest spoke Danish. Therefore, our guide narrated in both languages. Traci and I seemed to click instantly with the Londoners. A bus drove us a short distance outside of town to a surprisingly grassy field. There were some tents scattered throughout the area. The mosquitoes out here were absolutely menacing. I was wearing smelly Deep Woods OFF containing 98% deet. This seemed to keep the little buggers from landing on me but it didn't stop them from hovering around me. Traci wore her mosquito head net but still got jumpy from the sound of the insects buzzing past her ears. 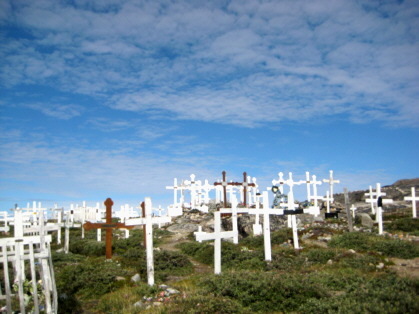 The guide led us on foot up a small hill to a cemetery containing wooden crosses. Some had flowers in front of them but the flowers were plastic since there are not many species of plants that can survive this far north. Each autumn, the town estimates how many people will die and then digs that amount of graves. It is important that they do this because the sub-zero temperatures, snow, and ice make it very difficult to dig graves in the winter. Our guide explained that the cemeteries are normally quite a distance outside the town because back when there were no leash laws for sled dogs, there were problems with dogs digging up the bodies and eating them! From the cemetery, we headed back towards the grassy field which turned out to be quite marshy and muddy. We were stepping on rocks to avoid sinking our feet into the moist ground. I kind of felt like I was part of video game as we went along trying to avoid the mud pits. I got a little too comfortable with the rock stepping and lost my concentration while talking to Traci. Squish! I missed a rock and sunk my left foot right into the marshy ground, much to the amusement of our London friends. I managed to catch my balance before taking a total mud bath. We arrived at a grassy area where it looked liked the land had been wrinkled into mounds. 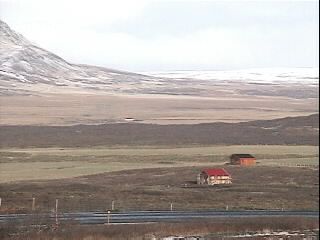 We were told this used to the settlement of the Saqqaq people who lived here about 4,500 years ago. This explained the mounds but we really had to use our imaginations to visualize anything beyond that. 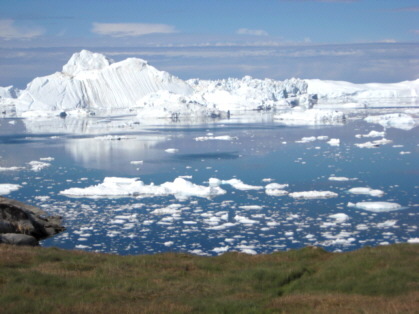 From this area we had our first close-up view of the ice fjord of Ilulissat Kangerlua. Fifty tons of ice calves (breaks off) from the glacier every day - enough to supply New York with fresh water for a year. 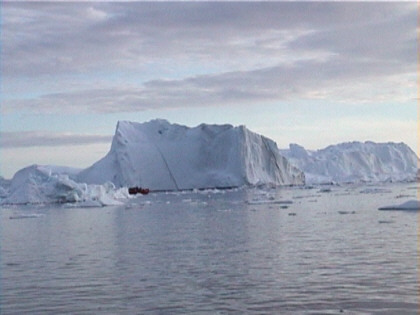 The ice fjord is a UNESCO World Heritage site. There was a sign draped by a dead bird covered in flies warning visitors to stay away from the water's edge because a rolling iceberg or calving ice can cause a sudden tidal wave capable of dragging a person into the icy depths. We continued up a hill to a point known as Suicide Gorge. This was the site where old women and injured children would jump to their death when they thought they were too much of a burden for their family. Some of the elderly men would meet death by stripping naked and wading into the icy waters until they succumb to hypothermia. From dogs eating corpses to fly-infested dead birds to suicides, I thought to myself, this sure is turning into a morbid hike. Our sweet young Danish guide finally took a break from all the tales of gore and served coffee and tea as we stood on the rocks at Suicide Gorge admiring the gleaming white icebergs in the ice fjord. The blue water was so still. It mirrored the sky and iceberg perfectly. It was such a postcard moment. 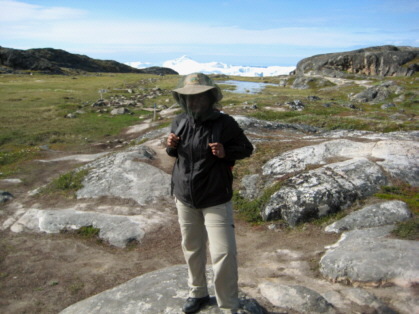 Traci is ready for hiking and mosquitoes. As our guide led us to the bus pick-up spot, the temperature was getting warmer. I shed some layers because I was beginning to sweat. The mosquitoes swarmed me with a vengeance. Just as I was about to resort to my mosquito head net, we arrived back at the bus. Despite this insect sendoff, it had been a very enjoyable hike. For dinner that evening, we tried the Brasserie Takanna on the upper floor of our hotel. It turned out to be our best meal in Greenland. Traci had the king crab legs and turkey kebabs for her courses. I had the baked halibut over cous cous. Of course we completed our meal by sharing a scrumptious dessert. Our evening wasn't over yet; we had to catch the shuttle back into town for our Midnight Boat Trip To The Ice Fjord excursion which was scheduled to depart at 10 PM. We had a strange experience while we were waiting for the World of Greenland van to take us to the harbor. There was a fireworks display going on in town. What made this so strange to me is that it was the first time I had seen fireworks in daylight. I could hear the booms and see the resulting smoke. It was just that some of the colors associated with fireworks just didn't show up as well against a blue sky. We boarded the small boat at 10 PM. As we pulled out of the harbor, Traci and I were happy to see our London friends from the hike earlier that day were on our boat. We also met a young couple from New York. We all talked and laughed as we sailed among the icebergs in Disko Bay. 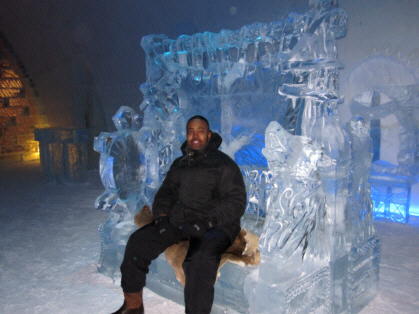 Sailing in the bay is like floating through a museum of ice sculptures. There were so many shapes and sizes of icebergs. 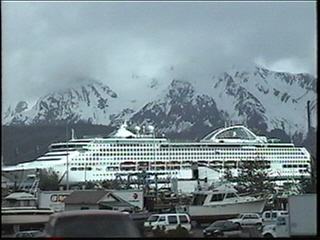 There were some that were as big as cruise ships - and that's just the part above the surface. We were told only 1/7 of a berg is seen above the surface. Some icebergs were pristine white. Some were grey from silt like the dirty snow that clings to the bottom of a car after riding on a treated road. It started to get quite cold as the captain picked up speed. We put on our hats, gloves, and scarves. When the cold really got to us, we retreated inside the boat where there were tables and chairs. Around midnight, the captain turned off the engine and came inside to give us a lecture about icebergs. He also touched on global warming which is often associated with Greenland these days. He told us that since moving to Greenland over 25 years ago, he has definitely noticed the climate getting warmer and a reduction in ice. 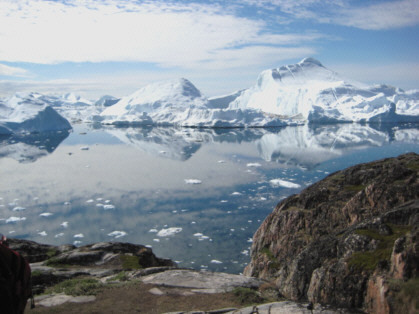 He said that ten years ago, Disko Bay stopped freezing over. 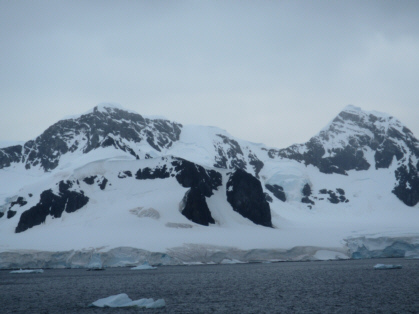 The exception was this past winter (2008) when we heard from several people, including the captain, that it was the coldest they've experienced in a long time. The bay completely froze over.